Stylish design and advanced functionality will change your events forever. Sell tickets quickly without unnecessary data filling and account creation by users. Promote a variety of events with the possibility of changing the view of the page. Manage your events wherever you are thanks to the responsive administration panel. Choose your style from ten different categories. 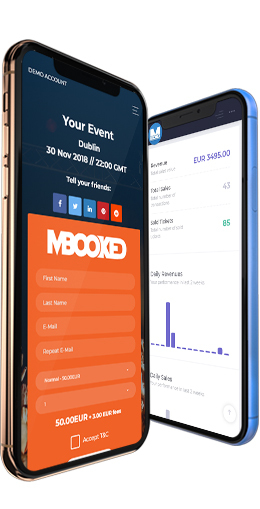 Mbooked all in one platform, is absolutely free to use for event promoters and planners. It costs you nothing. Our advanced payment processing system automatically sends ticket sales revenue to your account. We never withhold any money from your sales. Unlike other platforms, we only charge the service fee per individual transaction. Currently with the cap of 10%, but never more than 3 EUR / GBP / USD. We empower you to use Facebook business tools and Google analytics. We also created a robust affiliate marketing feature.